Shout-out to previous OPs PatriotP74 and TexasENG. Last edited by sev on Wed Dec 20, 2017 6:26 pm, edited 12 times in total. Anyone going to Law Day this week? Last edited by doglawin on Wed Oct 04, 2017 3:36 pm, edited 1 time in total. HenryHankPalmer wrote: Anyone going to Law Day this week? Last edited by doglawin on Wed Oct 04, 2017 3:35 pm, edited 1 time in total. Woah! I didn't know about this event, do you know if any of the law faculty, including the dean, will be attending? I'd be more than happy to drive down from Dallas dfor an opportunity to meet with them! I can't say for sure who will be there, but it is like an open house type deal with a mock class and panel interviews. I got an email about it and RSVPed awhile back, but I think you can find a link for it on the Admissions section of the website. Thanks for the heads up; also hadn't heard about it. Taking Dec LSAT and will apply. Former Marine, 16 years as a Texas State Trooper, BA in Criminal Justice, working on Master's right now. Let's see what happens. 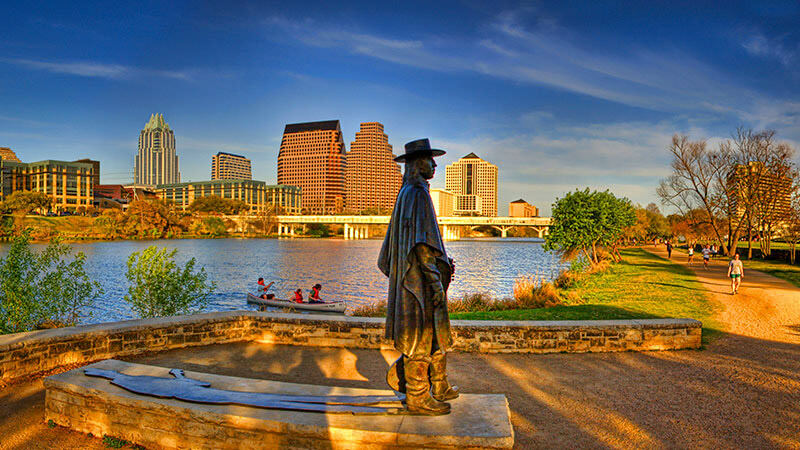 UT and Houston only 2 schools I'm applying to due to family reasons. Goal is to eventually be a Federal Prosecutor. Good luck to everyone. Checking in! Can't wait to hear how Law Day goes! Hi friends! 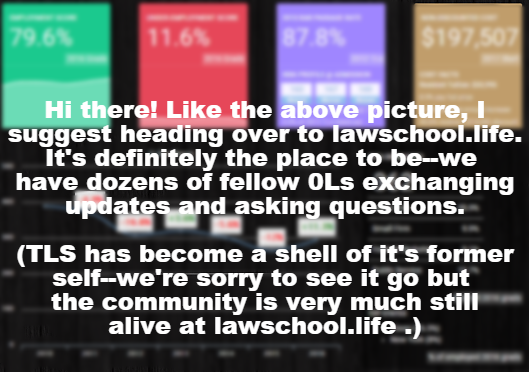 Look forward to meeting y'all at Law day! 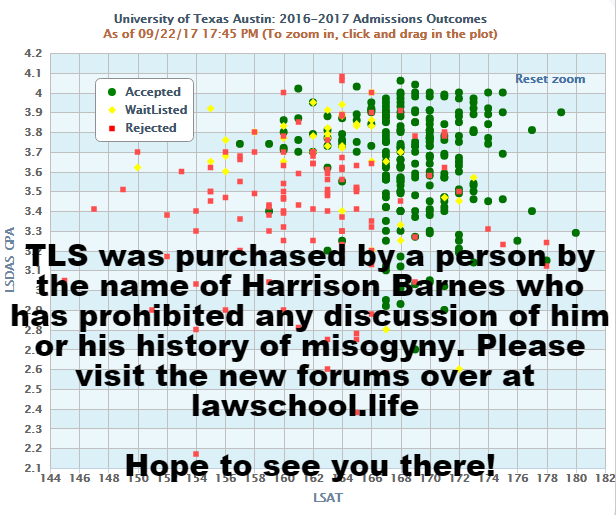 Does Texas Law offer fee waivers based on GPA and LSAT? 1. "Consider writing an addenda if your LSAT changes more than 4 points after a retake." 2. Resumes can be up to 3 pages for UT--they suggest using as much of it as you need. Don't leave stuff out, in other words. 3. More people will be getting interviewed than last cycle, but not everyone that's admitted will be interviewed. Last edited by rachelac on Fri Jan 19, 2018 12:12 pm, edited 1 time in total. 5. Apparently Texas jumped Georgetown in the latest USNWR rankings and they're now in sole possession of 14th place. 0_o Cool. Last edited by doglawin on Wed Oct 04, 2017 3:40 pm, edited 1 time in total. 4. (because I forgot #4) They don't actually start [strike]accepting[/strike] sending out acceptances RD until after they've handed out ED--which happens like mid-November/mid-December. ^I'm pretty sure I understood that correctly--can anyone confirm that's what she said? Last edited by sev on Thu Sep 28, 2017 10:32 pm, edited 1 time in total. 6. If you're retaking in December there's no guarantee that the new score will be considered if you submit before then--you'll have to call admissions and ask them to flag your application so it isn't considered before they receive the new score (they didn't sound super enthusiastic about people doing that, though, and recommended holding off on the application). sev wrote: 4. (because I forgot #4) They don't actually start accepting RD until after they've handed out ED--which happens like mid-November/mid-December. My understanding was not that they don’t start accepting RD until after they’ve handed ED but rather that they primarily focus on the ED apps. I know of people who have applied RD in Sept/Oct with stellar stats and subsequently get admitted around the same time as ED applicants.